Home / Mobility / Designing Baby Carriers that fit both parents! Fathers are increasingly taking an equal part and responsibility in parenting and raising their children. A very positive development that we love and want to encourage. In Sweden, it’s common to share the paternity leave and often both parents take at least a few months off work to stay at home with the newest family member. Fathers taking a bigger part in the parenting role and becoming a more equal or even prime caretaker of their children, their need for closeness to their child comes bigger and more important. Therefore, there is no reason that baby carrier should not be designed with fathers in mind just as mothers. It’s important that carriers are made to fit different sizes and body forms and are easy to use – for everyone! Why our baby Carriers are great for fathers – as well as for mothers! When Najell Original was designed the goal was to make a product that was comfortable and easy to use for both parents. We have designed the carrier so you can put it on like a sweater and buckle the waist belt on the side. With magnetic buckle and one-hand-fasting, you can insert your baby from the side, with easy and safe fastening using only one hand, leaving the other hand free to attend to your baby. The padded waist belt and shoulder pads, make it comfortable to carry for a longer period of time and easy to adjust to different sizes and body types. A nursing mother might have an easier time bonding with her newborn. The mother and her newborn child automatically spend a lot of time together, but the father might have to put in more work and effort before it becomes natural. That’s when a baby carrier can come in handy! Did you know that carried babies are happier and cry less? The connection that comes through carrying, creates a bond between parents and their baby and the baby feels safe. Click here to read about the benefits of babywearing for your baby! But what is special for men? We have designed the Najell Original Baby Carrier so there are no buckles in the back that are hard to reach. Of course, some men can be flexible, just as women can be stiff. But the fact is that most women are used to buckling bras in the back and are in general more flexible. Buckling in the back can be close to impossible for men, and there is no need for extra trouble when putting on a baby carrier. It should be easy, simple and comfortable. The magnetic buckles, that make it easy to insert and fasten your child removes the fuzz and insecurity of using a baby carrier. 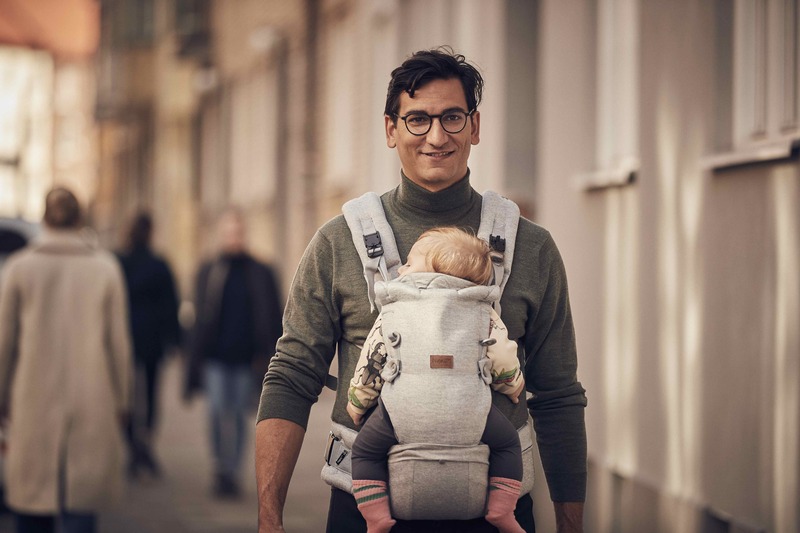 Fathers that might be insecure using a baby carrier can feel relaxed and secure, when putting on Najell Original and not afraid of doing it “the wrong way”. Najell’s goal is to make it easier for parents to continue living their own life after becoming parents. That’s why we design products that are easy to use and that enable a mobile lifestyle. We want to encourage parents to share the responsibility and help each other be able to have their own time and own life. Encouraging equality in the relationship, household and parenting role. Previous post: Do I need a baby nest? Next post: Be like James Bond with your baby carrier!